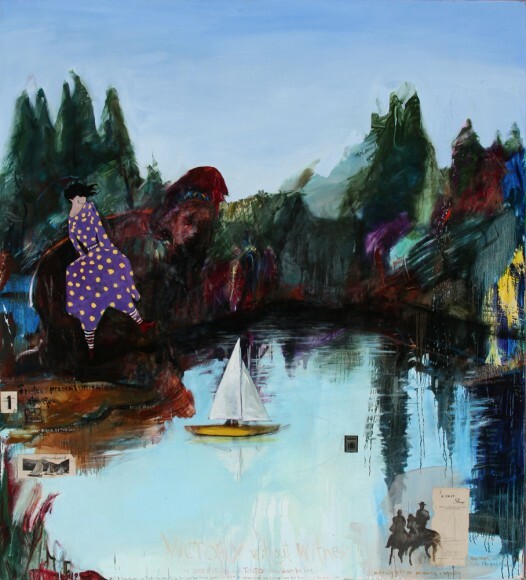 Royal Nebeker, Victory Without Witness, 2013 oil & collage on canvas 88" x 80"
The Schneider Museum of Art is excited to present colorful, energetic, and engaging exhibitions this summer. Royal Nebeker: An Artist’s Journey and Recent Additions to the Permanent Collection: Andy Warhol Silkscreens will open Thursday, June 19 and will be on view through September 6, 2014. 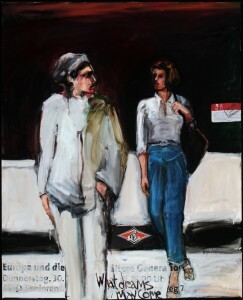 Royal Nebeker: An Artist’s Journey features the beautiful figurative paintings and collages of Royal Nebeker. Nebeker received his MFA from Brigham Young University and continued his art studies in Norway, where he became deeply influenced by the work of Edvard Munch. Nebeker’s painting also reflect his engagement with Abstract Expressionism. He currently resides in Astoria, Oregon, and he has held residencies and has exhibited widely throughout the world. Royal Nebeker: An Artist’s Journey is sponsored by Miller Paint Company. 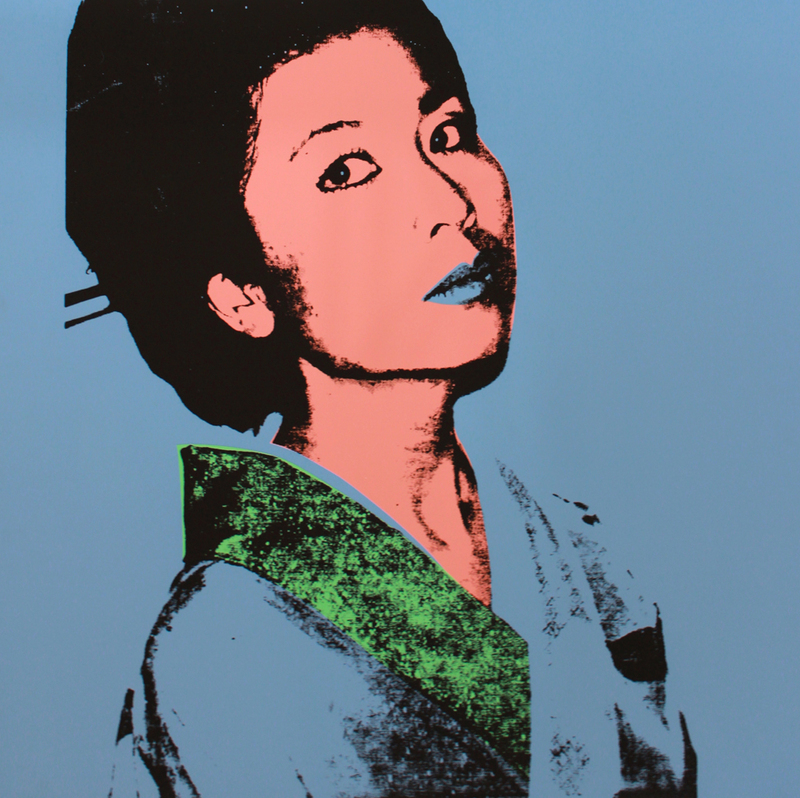 Andy Warhol, Kimiko Powers, 1981, Original screenprint on Lenox Museum Board. Extra, out of the edition. Designated for research and educational purposes only. © The Andy Warhol Foundation for the Visual Arts, Inc.
Nebeker’s exhibition of paintings will be complemented by Recent Additions to the Permanent Collection: Andy Warhol Silkscreens. Numerous silkscreens were generously donated by The Andy Warhol Foundation for the Visual Arts, Inc. this year. While on display, the silkscreens will be accompanied by informational panels written by SOU students. Andy Warhol, one of the founders of the American Pop Art movement, is best known for his iconic screen prints of commercial objects such as Campbell’s soup cans and Brillo pads, and for his portraits of celebrities like Jackie Kennedy, Elvis Presley, and Marilyn Monroe. On view at the Schneider Museum of Art will be a collection of screen prints including Sitting Bull and Kimiko, created in the early and mid 1980’s. While Sitting Bull is part of his recurrent theme to reproduce influential cultural icons, who is Kimiko? She was one of his patrons who, along with her husband John Powers, amassed one of the most comprehensive collections of Pop Art in private hands. The Schneider Museum of Art summer exhibitions will be augmented by docent tours for all ages, hands-on activities, and special events, such as lectures, concerts, and performances. The Museum will hold a weekly docent-led tour for the public on Tuesdays at noon. Additionally, the Museum will hold FREE Family Days – see below for more information. Please join us on Thursday, June 19, 2014, from 5:00 to 7:00 PM for the opening reception for Royal Nebeker: An Artist’s Journey and Recent Additions to the Permanent Collection: Andy Warhol Silkscreens. The reception will feature an Artist’s Gallery Talk with Royal Nebeker at 5:30 PM. Crater Lake Cellars is generously donating and pouring wine for the reception. The exhibition runs from Friday, June 20 through Saturday, September 6. Summer Hours for the Museum are Tuesday through Saturday from 10 AM to 4 PM. On June 28, the focus of the Family Day will be Andy Warhol. Families can view and tour the Recent Additions to the Permanent Collection: Andy Warhol Silkscreens exhibition, which includes a number of Andy Warhol silkscreen prints. In the activity room, families can experiment with some simple printmaking techniques. On July 12, the focus of the Family Day will be Royal Nebeker. Families will tour the Royal Nebeker: An Artist’s Journey exhibition of paintings of Royal Nebeker – an Oregon artist with Norwegian roots. Families can play an engaging discussion-based game to help explore the imagery of Nebeker’s paintings. Children are invited to make silhouette self-portraits in the hands-on activity room. On July 26, the focus of the Family Day will be Museums and Collections. Families will explore the important role museums play and view a selection of items from the permanent collection that are rarely on display. Children can build and decorate a box to house their very own collection in the hands-on activity room. ←Previous Post: Two Great Events this Week at the Schneider Museum of Art!